The Roxborough Area Historical Society invites you to explore various collections of historical information at the Douglas County Libraries and DC History Repository. Wednesday, November 14th, 2018 at 5:00 PM. I bet you are wondering…”what is a repository?” It is where the cultural and historic resources are stored until there is a Douglas County Museum established. Come with us and view some of the artifacts housed at the Repository. Douglas County Libraries Archives and Local History (ALH), formerly the Douglas County History Research Center, collects and preserves the documentary history of Douglas County, Colorado. The collection represents communities across the county and may be used by anyone interested in Douglas County's history. Make your reservation No Later Than November 12th at www.roxhistory.org. Space is limited. 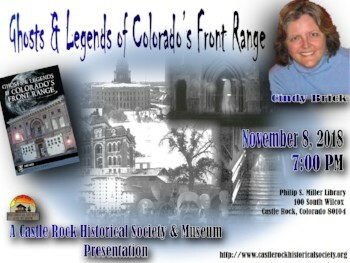 Please join us on Thursday, Nov. 8, 2018 for a presentation by author, Cindy Brick on her book “Ghosts & Legends of Colorado’s Front Range”. Have you ever heard of ghostly sightings at such places as Hell Tree outside Fort Collins, a murderer stalking the halls of the Greeley Courthouse, and floating heads in the Capital Building? Come hear Cindy Brick talk about these tales and more gripping stories. at the Douglas County Libraries and DC History Repository. We need you to judge for the 2019 Greater Denver Metro NHD Regional Contest on March 16th, 2019. Our contest is growing and we are expecting around 500 students this year which means we need roughly 100 judges to volunteer to help our metro area students. I have opened the link to sign up. The theme for 2019 is Triumph and Tragedy in History. Please only register once for the contest. There are many contests on that day around the state of Colorado, so please be sure to only sign up for one. Thank you for your efforts, and as always, please feel free to email Kelly, the Regional Coordinator, below, if you have any questions. We are looking forward to seeing you on March 16th! 100 S. Wilcox , Castle Rock. We’ve all seen western movies, whose theme revolves around the Civil War, with blue and grey uniformed troops, artillery fortification and combat. How much of this is true, and what really happened the those 1860’s battlefields of what is now Arizona, New Mexico, Virginia, Pennsylvania and Missouri? Join the Roxborough Area Historical Society for an informative, educational and entertaining presentation by Brent Brown, who specializes in 1800’s Civil War antique military equipment, displays, and re-enactment. Mark your calendar for Thursday, August 23, 2018, 7 pm, at the Roxborough Park Community Center, 6237 Roxborough Drive, Roxborough. This is a no-cost event; includes light refreshments. "The Day The Dam Gave Way"
Take a trip through history by visiting the Lucas Homestead off Cherry Creek and Castlewood Canyon to hear all about the day the dam broke in 1933. We'll also visit the area known as Russellville where the first glimmers of gold were found in 1858. Onward we'll travel to the Twenty Mile House Site and Marker to Cherokee Trail and then on to tour 17 Mile House and Farm ending back at the Castle Rock Museum. 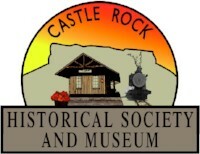 Tickets are $45.00 per person and can be purchased at the Castle Rock Museum or online on our website www.castlerockhistoricalsociety.org under the Event Tickets tab. Lunch is included. There is a limited number of seats, so please sign up early. This event is planned as a celebration of the living Native American artifacts, known as Prayer or Spirit Trees, left us by the indigenous people of present-day Colorado, including the ancient Ute. Invited guests include Dr. James Jefferson, Southern Ute Tribal Elder, artists Deb Bartos and Terri Sanchez, photographer Sherri Mabe, and Culturally Modified Tree / Prayer Tree FaceBook Page creator Barry Trester. Please come join us, purchase an author signed copy of any of my three books, view the beautiful tree art and photography on display and invite your friends and family. The cost of my newest book is $41 and most of the art and photography is also available for sale - this casual event is free, open to the public and RSVPs are not required. Join the ECHS as we tour 17-Mile House Farm Park, a 158-year old farm which served as an important resting stop for pioneers traveling on the Cherokee/Smoky Hill wagon trails in the 1860’s. Cherry Creek Valley Historical Society president Garry O’Hara, will present a program on this Arapahoe County-designated heritage area which includes a historic house, red barn, silo and milk shed -all of which were restored to their known condition in the early 1900's, as well as two replica windmills and 30 acres of open space. some of the controversies that have continued since his death in 1917. June 16, 2018 (Sat.) - 2:00 PM - Love in the Afternoon; Romance Author Tea. Register with the library staff or online. Books will be available for sale and signing at the event. June 7, 2018 - Monthly presentation by Lisa Schoch from CDOT about the construction of the Eisenhower/Johnson Tunnel. June 23, 2018 - Bus tour of Southern Douglas County. Contact the Castle Rock Museum to purchase a ticket. Join us in the Great Hall on Wednesday May 16th for a lecture by Dr. Al Koch, Director of the Cherokee Ranch Science Institute, about the cool and complex mystery of nearby geological gold placer deposits. A limited number of reservations are available free of charge to persons with School ID's. June 23, 2018 - Walking tour of Downtown Castle Rock. Meet at the Courtyard on Perry at 10:30am. On behalf of Dr. James Jefferson, Southern Ute Tribal Elder, we invite you to join us in becoming a member of our newly formed Association for Native American Sacred Trees and Places (NASTaP). The purpose of this nonprofit organization is to inspire the discovery, appreciation and conservation of Culturally Modified Trees (CMTs) and places believed to have been held sacred by Native American people. Go to https://www.nastap.org/ which further explains our mission, member privileges, dues, and can also be used to sign up to become a member. More information is available at www.nastap.org and you can enroll online if you prefer. Please help us spread the word about NASTaP by distributing copies of the attached brochure and by forwarding this email to your friends and family to help reach our goal of having 100 Charter Members enrolled by the end of 2018. Thank you for your consideration, we look forward to welcoming you as a new member and seeing you this summer at NASTaP's 1st Annual Conference August 2-5, 2018 at the historic Glen Isle Resort (www.glenisleresort.com), 573 Old Stagecoach Road, Bailey, CO.
Mammoth remains and pioneer roots featured in public tours. Visit the fully restored Crull/Hammond cabin and see how pioneers lived in the 1800s. Have you ever seen pre-historic mammoth remains or toured an 1860’s pioneer property? These encounters and more are in store during National Historic Preservation Month activities in Douglas County. On May 5, free, guided tours offer area adventure seekers the opportunity to learn about some of Douglas County’s first inhabitants. The tours feature the Lamb Spring Archeological Preserve. The Lamp Spring Archaeological Preserve tour begins at 9:30 a.m. Interested in attending the May 5 tours? Your RSVP is required in advance, as space is limited. Please visit www.lambspring.org to register. On Saturday, May 19, experience living circa 1880 at the Crull/Hammond cabin, the County’s first post office constructed of logs dated to 1874. Tours will be offered from 10 a.m. – 2 p.m. Registration not required for a tour of the cabin, located at 6225 Bear Dance Drive near Larkspur. “Douglas County’s investment in historic preservation, as well as the tremendous community support for these assets is evidence of the value we collectively assign to our County’s history and heritage,” said Douglas County Commissioner and Acting Board Chair Lora Thomas. The Crull/Hammond Cabin is the site of the often-told tales of Douglas County’s history, the story of Lamb Spring dates back even further — to the end of the last Ice Age. The Smithsonian led multiple excavations at Lamb Spring in the 1960s and 80s, resulting in discovery of remains from more than 30 mammoths that trace back between 11,000 and 13,000 years. The tours are sponsored by the Douglas County Historic Preservation Board and the Lamb Spring Archeological Preserve. Mrs. Lincoln will take us 153 years back in history to the evening of Good Friday April 14, 1865 as she prepares to leave with President Lincoln to attend a play at Ford’s Theater. We welcome all to attend this special evening presentation this Friday, January 26, 2018 at 7:00 PM at the Roxborough Park Community Center, 6237 Roxborough Drive, 80125. Donations are always welcome to defer the costs of the occasion. There will be a brief business meeting prior to the event. Annual Dues will also be collected at our January Meeting. Individual Annual Memberships $15.00/Year ~ Family Annual Memberships $20.00/Year ~ Business Membership $100.00/Year. This will be the last year we offer Lifetime Memberships for $100.00. Prices for Annual Membership will increase in January 2019. In an effort to raise the necessary matching funds for the Silica Kiln Preservation Project, we will be offering a special this year. For $200.00, those interested will receive a Silica Brick and be grandfathered into our Lifetime Membership Program at $100.00 (before the prices increase in 2019). It is with both sadness and excitement that I let you all know that Shaun Boyd has accepted the position of Curator of Archives at History Colorado. Shaun joined the DCHRC as an Assistant Archivist in November 1998 and was promoted to Archivist in the fall of 2000. In her tenure with us Shaun has had an impact on the DCHRC, the local Douglas County historical community and the profession. Shaun’s role in developing the DCHRC into a respected Archive cannot be overstated. She launched the first DCHRC website (using Word, on the night she started library school!) She implemented most of our cataloging and processing systems, compiled and wrote the full processing manual, and processed and made accessible countless historic collections. Shaun was the DCHRC liaison to the Douglas County Historic Preservation Board, served on the Castle Rock Historical Society Board, helped to create Historic Douglas County, provided research and assistance for many Douglas County TV documentaries, edited two books, contributed articles to the newspapers and various historical publications, and provided hundreds of hours of school talks and outreach events. In the larger profession Shaun served on the Society of Rocky Mountain Archivists Board, the Academy of Certified Archivists Board and the Colorado Historic Records Advisory Board. She also taught classes in Genealogy Research at the Library School at DU. In her new role Shaun will oversee the management, acquisition, research, and interpretation of the History Colorado archives collection. This collection includes books, maps, newspapers, serial publications, oral histories, sound recordings, ephemera, and over 8000 linear feet of manuscripts. Shaun describes it as a “basketball court full of stuff.” In addition, she will develop museum exhibits; reach out to the community through public presentations, educational programs, published works and social media; supervise contract staff, volunteers and interns; and participate in strategic planning for the organization. Her experience at DCHRC has prepared her well for this challenge. As you all know…Shaun is a dynamo. Her great love is history and she has spent the last 19 years sharing our community’s history through storytelling. Her energy, her deep knowledge and her humor will be missed. Shaun’s last day is February 9th. We will say goodbye on February 8th from 1pm to 4pm in the Castle Rock Bank Room West. I’ll send an official invitation as we get closer to the date. check us out on facebook at @CRhistoricalsociety. Dusk Bear Canon Cemetery Walk on Saturday, October 28, 2017 from 5:00-6:00pm. Please join us on Saturday, October 28, 2017 for a walking tour of the Bear Canyon Cemetery off Highway 105. The Bear Canyon Cemetery was founded in 1872 and contains the remains of pioneers significant in the early history of Sedalia, Castle Rock and Douglas County. Please meet at the Bear Canyon Cemetery at 397 N. Perry Park Rd. Sedalia, CO 80135. The tour will begin at 5:00 pm. Refreshments will be served following the tour. For more information contact the Castle Rock Museum (303) 814-3164, museum@castlerockhistoricalsociety.org, www.castlerockhistoricalsociety.org. Tour is free and reservations are not required. Highline Canal History and Nature Walk, Saturday, October 28, 9-11 a.m. at Seven Stones Botanical Garden Cemetery Shelter. Fall is here! Time to head outside and enjoy the changing colors & wildlife! The Roxborough Area Historical Society (RAHS) and Seven Stones Botanical Gardens Cemetery are delighted to host an outdoor event featuring the Highline Canal Conservancy and Audubon Society of Greater Denver on Saturday, October 28th from 9-11am. Harriet Crittenden LaMair, Executive Director of the Conservancy, will provide a unique historical overview of the Highline Canal, focusing on highlights from our Roxborough area. She will also give an update on the next phases of the Canal Conservation project. We are also pleased to share Harriet’s recent honor as the recipient of the Jane Silverstein Ries Award, which recognizes a person, group or organization that demonstrates a pioneering sense of awareness and stewardship of land-use values in the Rocky Mountain Region. Following Harriet’s historical presentation, the program will transition to the Highline Canal itself with a 40 minute guided walk from Kate Hogan, Community Outreach Coordinator with the Audubon Society of Greater Denver. Kate will share unique characteristics of local birds we see along the trail and Harriet will point out key aspects of the Canal during our walk. Attendees will return to the outdoor Auburn-colored Shelter at Seven Stones and conclude with light refreshments and Q&A. Images of America, Roxborough books will be available for purchase, as well as Silica Bricks for our “Save the Kiln” campaign. Kindly RSVP via Seven Stones’ Website or via Facebook. We look forward to seeing you outside this Fall! There is no registration fee for this event; however, you are on your own for the cost of all travel, lodging, meals and outside activities (carpooling is encouraged). On Thursday evening Dr. Jefferson will welcome us at Kuchu's Restaurant, in the Ute Mountain Casino & Hotel, at 6:30pm followed by a casual conversation over dinner starting at 7pm. Recommended Lodging: For both nights is the Ute Mountain Casino & Hotel ($39.95 + $4 tax = $43.95) on the Ute Mountain Ute Reservation and breakfast/lunch/dinner is available at Kuchu's Restaurant (conveniently located inside the Ute Mountain Casino). Friday morning we will meet at 8:30am in the hotel lobby to carpool to the Ute Mountain Tribal Park for a Ute guided tour starting at 9am (then back to the hotel for lunch on your own). At 1:30pm we will meet again in the lobby and carpool to the Anasazi Heritage Center (which also serves as the visitors center for the Canyons of the Ancients National Monument). Dinner Friday evening will be back at Kuchu's Restaurant (featuring an all-you-can-eat seafood & prime rib buffet for $19.99) and conversation with Dr. Jefferson (who is staying over in Towaoc and planning to join us for breakfast each morning). Saturday morning we will depart the Ute Mountain Ute Reservation and head to the Southern Ute Reservation, where we will meet Dr. Jefferson at 10am at the Southern Ute Cultural Center & Museum (followed by lunch at the Sky Ute Casino Resort, 14324 Hwy 172 North, Ignacio, CO 81137). Suggested Travel Route: From Colorado Springs take I-25 south to Walsenburg, then west on Highway 160 to Cortez, then south on Highways 491/160 to Towaoc (11 miles south of Cortez, CO) on the Ute Mountain Ute Reservation at the foot of Sleeping Ute Mountain. On the way home Saturday afternoon, if you have the time, you might enjoy exploring the collection of projectile points and other Native American artifacts on exhibit at the Gunnison Museum Pioneer Museum, 803 E. Hwy 50, Gunnison, CO 81230 (970.641.4530). Please let Dr. Jefferson and I know if you are able to join us. 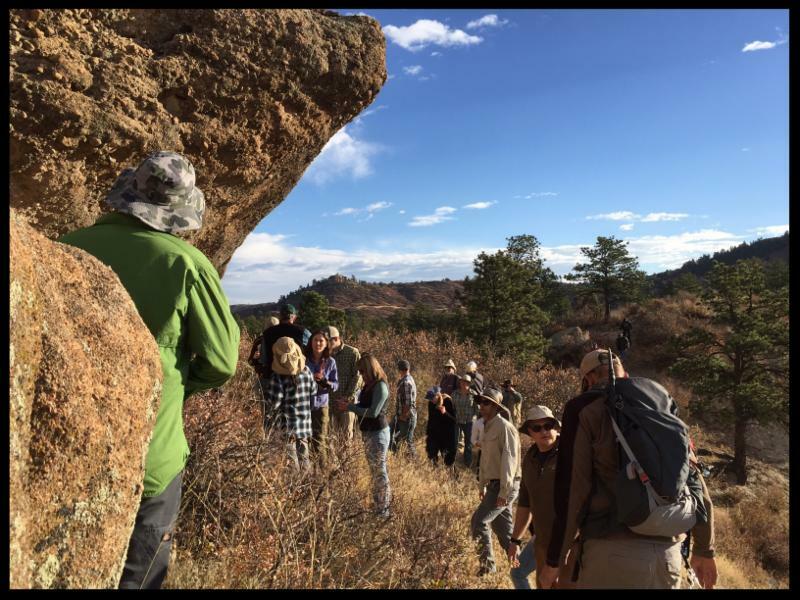 The 2017 fall Homestead Hike of the south trails of Roxborough State Park will Saturday, October 7 starting with a short lecture in the auditorium at 9:00am. The total hike is 7 miles (6 hours) and visits ruins of multiple homesteads in the south end of the park. There are turn around points for a 1.5, 2.5, or 4 mile total hike length. The hike to the last two remote stops is steep but worth it. Expect to see colorful aspens and scrub oak. We just cleared the way to the hundred year old Lawrence Waterhouse horse shed, so it'll be a new structure to explore. That's 1.2 miles from the visitor center, in case you like your hike on the shorter side. The hike to the last two remote stops is steep but the views and homesteads are worth the time and effort. Led by Naturalists Mike Thomas, John Healey, and Betsy Healey. Bring water, lunch, and appropriate gear for the weather and your hike duration. This hike focuses on interpreting the beautiful landscape of Cherokee Ranch. The hike goes over Raccoon Knob and Cherokee Mountain. Participants will learn how to interpret the sedimentary layers and decode the past. Massive floods, deadly volcanic eruptions, and the floodplain of an ancient river containing trees are just some of the amazing geology. Don't just walk the trails ... live them! History comes alive on the 3,400 pristine acres surrounding The Castle. Get a fascinating glimpse at unique fossils and into the lifestyles of area American Indians and frontier settlers. Our knowledgeable guide will make your outdoor hike truly an exercise in the early Colorado experience. hiking and the most majestic of mornings.